circular plastic case, it comes with just the label for the product description, and a mini usb charging cable. Please note that there is no charger included so you will either need to plug this little guy into a computer or a usb phone charger if you have one. Our test period was seven days for about 30 minutes of use each day. The SpeakStick was about 15 feet away from the bluetooth transmitter which was a Samsung Galaxy Note 4. The SpeakStick had a stable connection throughought our testing and was able to stream music without a hitch through a solid wood door. The Audio that is produced by the mono 3" tall by 2" wide SpeakStick is not to be envied, but for its purpose and price range we feel it is a good buy. 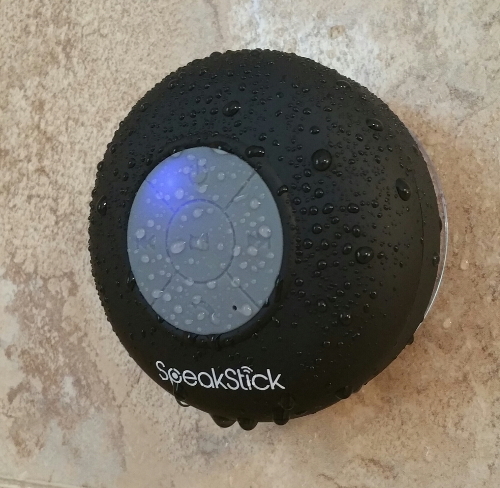 The SpeakStick is capable of skipping ahead to the next track, going to the previous track, or pausing the music all together. We found it strange that we didn't see any buttons to increase or decrease the volume but after a little google searching we found that if you depress the next track or previous track buttons for a long time it will adjust the volume accordingly. We feel that just for this reason the device should have included a manual as we could see how someone could get frustrated thinking the speaker is not capable. We found the phone capabilities to be rather subpar, we were able to hear the other party but every time we would speak to the other party would say that we sounded like we were under water or muffled. We tried this test again outside of the shower after letting it dry thinking that some water may have gone in the hole for the microphone but the results were the similar. If you are looking to talk on the phone while in the shower, this probably isn't a great choice for you. - No indicator on the device to let you know you can change volume, we found that it is possible if you just keep the next/previous tracks button pressed! - Sound quality is not good but for the price and actual use you really cant ask for more. - Since there are no instructions we couldnâ€™t identify if it was water proof or water resistant. We did not try submerging it in water as it looks like it is only water resistant. - Quality on phone calls was not good. Overall the speaker does what it's supposed to and looks rather appealing so it wont be an eye sore in your bathroom. The SpeakStick also comes in various colors so you may even be able to match it with your decor. We also found this little speaker to perform quite well when being used as a speaker for your Phone GPS if you have an older vehicle or one without integrated Bluetooth. This allows you to play your music on your car stereo while not missing your next turn.